tiny eggplants (makeua phuong มะเขือพวง) found! I found tiny pea-sized eggplants at my local Cambodian market in North Philly. 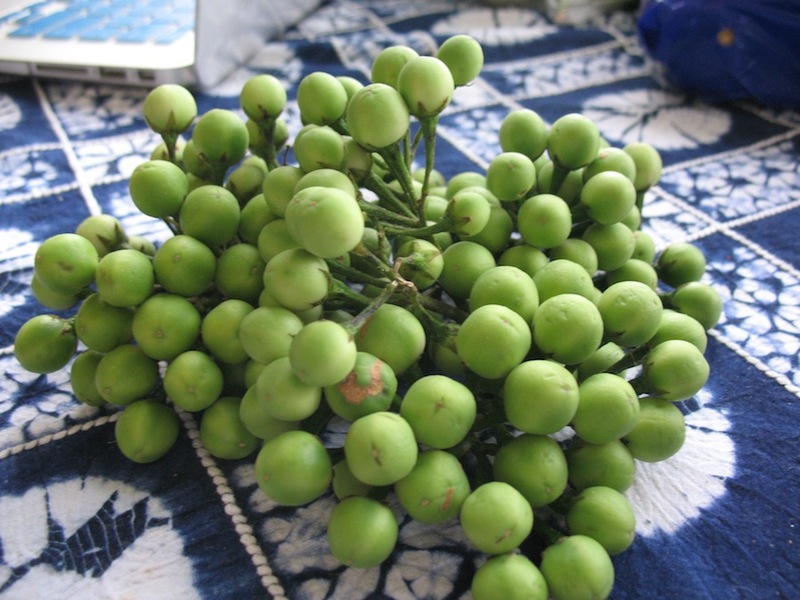 This fruit (Solanum torvum, aka turkey berry) is commonly used in Thailand, and is known there as “cluster eggplant”, or makheua phuong มะเขือพวง. 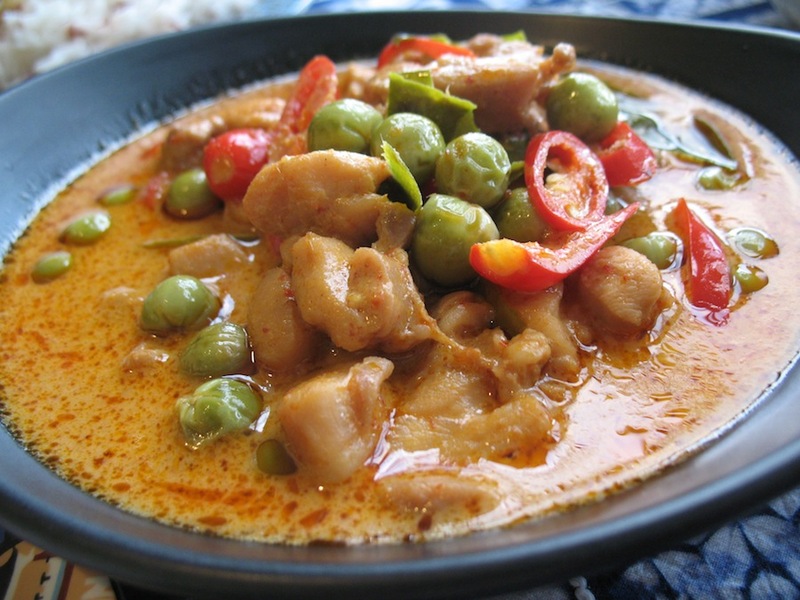 In Thai food, perhaps the most recognizable dishes with this ingredient are curries, like penang curries (image at bottom of page with La’s recent effort), or green curry. A delicious Cambodian dish that uses this ingredient is prahok ti ប្រហុក​ខ្ទិះ, which I found, ready-made in a stack of plastic containers on the counter. [Update 17 Jan 15: it seems the proper pronunciation of this dish is “prahok katii”.] When the shopkeeper seemed challenged to explain what it was, I figured I should buy some and check it out. I’m happy I did, it was incredibly rich and delicious. At first I thought it was going to be something similar to a Northern Thai favorite, nam prik aung น้ำพริกอ่อง, but it was quite different. It was with ground pork, and the important flavors that stand out are prahok (hence the name), as well as kroeung (see here for a post regarding these two important Cambodian ingredients). Other important flavors present were coconut cream and palm sugar. It was kind of sweet and oily. This dish is meant to be eaten with veggies as a dip, and it’s also good for dipping sticky rice in too. La said there is a Thai equivalent for this, called lon หลน. Coincidentally, I found a 1966 cookbook the other day Everyday Siamese Dishes where I found recipes for lon, that indeed sounded quite similar to prahok (ka)ti. My next post will highlight my recent cookbook finds. I found a really nice video explaining prahok (ka)ti, from Australian TV network SBS. Check it out to get a sense of how it is put together, and you can find a decent recipe there too. There are also several recipes (here’s one for example) out there online, but they are in Khmer. For the above prahok (ka)ti that I got locally, it looks like they dry-fried the tiny eggplants in a pan first to darken them before adding them in. Another day this week, La used those tiny eggplants to make a chicken penang curry. With this preparation, she simply added the eggplants (detached from their bunch) into the coconut cream and curry mixture and boiled them. The eggplants have a hint of bitterness to them, and a nice slightly grassy crunch. 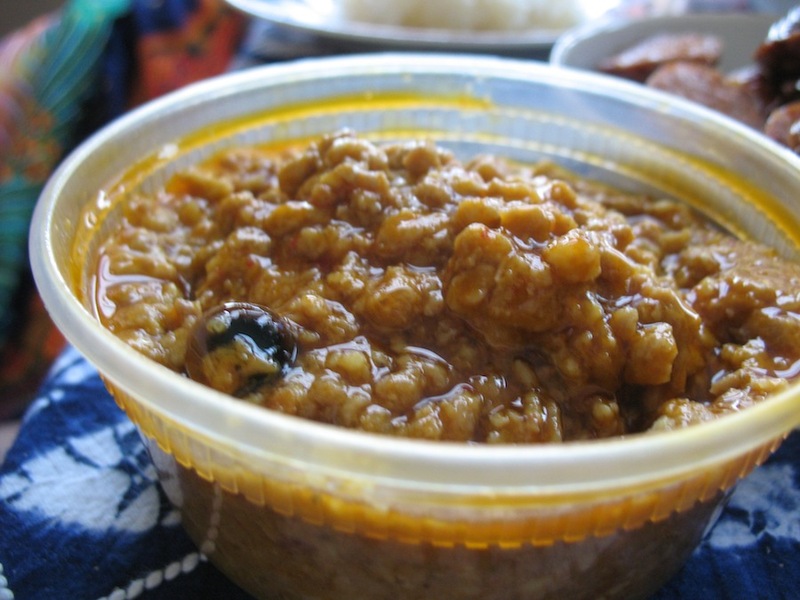 A perfect match to the sweet/savory of the coconut curry or the coconut-prahok combination. This entry was posted in - Featured Food Discoveries, - Featured Markets, Cambodian food, Thai/Lao food and tagged ​ពុត​លំញង, ប្រហុក​ខ្ទិះ, มะเขือพวง, แพนงไก่, baby eggplant, pea-sized eggplant, penang with baby eggplants, pout lomhong, prahok gatee, prahok kti, prahok ktis, prahok ti, prahok with pork belly dip, turkey berry. Bookmark the permalink. I’ve been looking for those! Where is the market? It sounds great. Thanks for your question Marco. I’ll respond directly to email with some suggestions.